Blade height (at heel): 1.75 in. Description: Ajikiri Deba Hocho are shorter in length than other deba. They are named for the horse mackerel, "aji", that they are traditionally used to cut. Ajikiri are ideal for deboning meat and small fish and are used for many other general purpose cutting tasks - from cutting chicken and pork to beef. They can be used for detailed cutting jobs that would be performed by a paring knife in the Western kitchen. The heaviness and thickness allows for easy chopping through fish bones, while its ability to take on an extremely sharp edge allows for delicate work and the filleting of even the smallest fish. Knives by Teruyasu Fujiwara are among the best performing knives anywhere. The quality of the sharpness is exceptional and the edge retention is nearly unparalleled. Additionally, the hand-hammered surface reduces the likelihood of food sticking to the side of the knife while slicing. Teruyasu Fujiwara the fourth has named these knives Maboroshi no Meito, “Visionary Sword Celebrated in Victory" -- a bold claim, but one that is deserved. 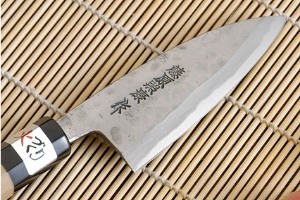 Fujiwara’s knives exceed all expectations of performance and edge holding. Over 130 years ago, Teruyasu Fujiwara the first began his career as a master blacksmith, forging farm tools. When his son Fujiwara the second was of age, he was apprenticed to the famous Tokyo swordsmith Masahide Suishinshi. After some years of training, he retuned to his father’s shop and commenced his successful life as a master swordsmith. The family continued this tradition until sword making was restricted after WWII. By the end of the 1960s, the Fujiwara family began making kitchen knives.They were determined to make knives that would make a swordsmith's family proud. To this end, they spent the next ten years developing the steel and techniques necessary to forge-weld stainless steel with high carbon steel and then properly temper the blade. It took all of the knowledge gained by the family from more than 100 years of forging swords to successfully produce their current offering of kitchen knives. 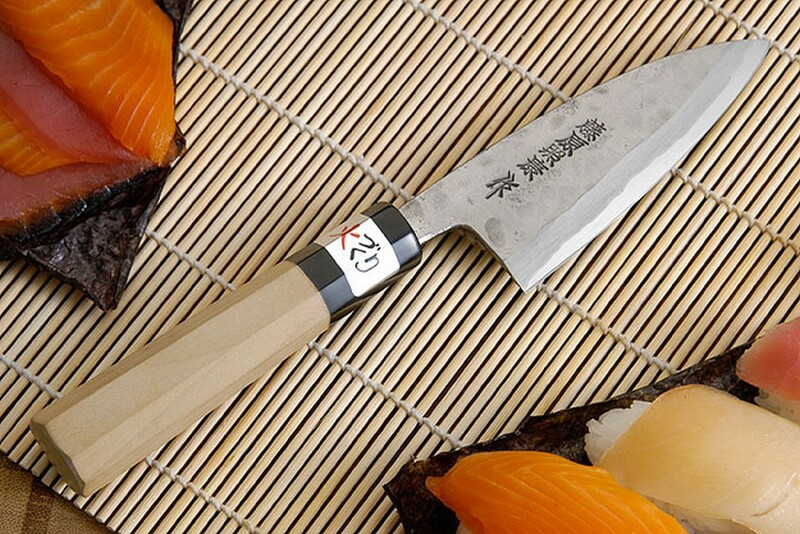 Since the late 1990s, Fujiwara the fourth has continued the family tradition. 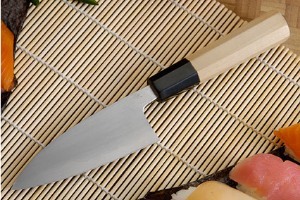 Traditional Japanese chef's knives differ from European-styled knives in that they are sharpened with a bevel on only one side. The opposite side is slightly hollowed. Because of this, these slicing knives can generally be honed to a sharper edge than can double bevel knives. The D-shaped handle is formed from ho wood, a close relative of magnolia. The handle has a front ferrule formed from buffalo horn. Each blade comes razor sharp. Designed for right-handed use. 0.10546875 0.02734375 105.46875 27.34375 Trailer Started. 0.21875 0.11328125 218.75 113.28125 Trailer Completed.